Knowing that I didn’t need to leave until 1pm to make my destination tonight, I took my time and relaxed this morning. It was glorious! I still woke up early naturally, but I liked that I could do everything at a relaxed pace. 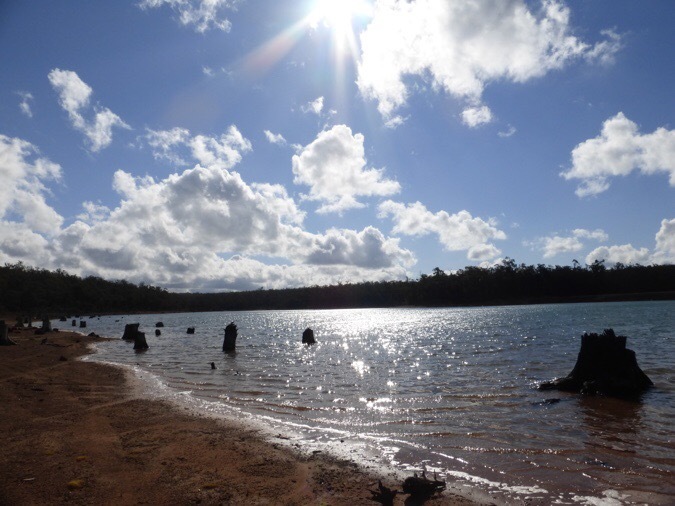 I did the blog from yesterday, ate the continental breakfast at the hotel, did laundry, watched another episode of Modern Family, some of Bloodline, and took the five minute walk to Woolworths to do my resupply, and ate lunch. Quite the productive morning. I’ve been working on my efficiency with town chores and I think I’m getting a good routine down. I am getting the hang of this resupply thing and it is going much faster than I thought it would. Even in daily life, I don’t like going to the grocery store. Anything that involves walking around and shopping drives me nuts. I am all about wanting to just get it done and not go up and down aisles trying to figure out what I want. I have the list, I go straight for it, and then I leave. Again, it is going to be a short leg before I get to my next resupply, which I sent a box to because it is very remote. The only thing I find myself missing now in my food is my flavored drink mix. Here they do not sell little packets to flavor drinks, but they do have large containers of Powerade powder and little squirt bottles of flavor I’ve always been weirded out by. I could do the Powerade, but it’s not my favorite and the containers are so large and expensive it would not be worth buying for just a small portion for each leg. I am trying not to send boxes as much. I just miss my raspberry lemonade Crystal Light packets. I haven’t missed it as much in the cooler weather, but I know I will greatly miss that when it gets hot again. I do have some coming in the three resupplies I did send on this trail that I brought over from the US and I will savor each and every one of them. I am thinking about doing a bulk order on Amazon to send to NZ for the TA so I can send to a few places and then just carrying it so that I can spread it out and maybe have it at least every other leg or something. Maybe in New Zealand they have those packets. Does anyone in NZ, particularly Auckland, where I will land and do some resupplies, know if I can get packets of flavored drink mixes there? Particularly some kind of raspberry lemonade or pink lemonade? Nothing that is fizzy like carbonation as that bothers my tongue and throat. I discovered another mistake that I made in my resupplies today. The guidebook that I have only covers a third of this leg and I mistakenly put the next one I needed in the next resupply box 3 more days away. Fortunately, I noticed it while in town, and was able to put out some feelers to people out here who also have the guidebooks. Catherine, who I had dinner with the day before I started the Bib, came through and sent me photos of the pages I needed. THANK YOU Catherine once again for being awesome! 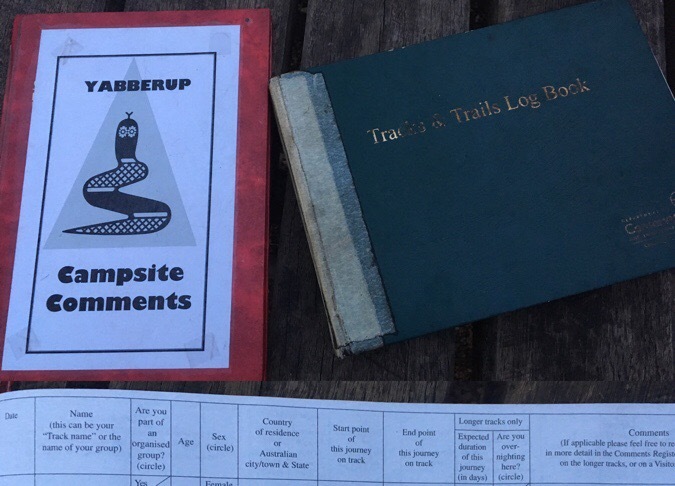 If the guidebooks weren’t available, I do have the GPX track, a spreadsheet of distances, and the trail markers are so frequent that it would’ve been fine for just a few days without detailed guidebooks. Sometimes, they are even at the shelters and the chances are I might run into someone else out here who would have had it and let me take some photos of the pages I needed. Yes, once again my lack of detailed reading skills is not helping me! When I hike with other people, they can pick up the slack in these areas, but when I’m out here on my own, I pretty much have to pay the consequence. Fortunately, there is a great support system out here for me. You all are great! I headed out to a beautiful day with some wind, scattered billowing white clouds, and a blue sky. I even got to wear shorts and a t-shirt! It was in the upper 60s/20C. There is definitely a front coming in, and it is in the air as the clouds are doing that thing where they move really fast again and the wind comes in stronger gusts. It’s swirling quite a bit tonight. Looking at the weather, it is pretty definite that it will rain the next three days of this leg. The good news is that it is warming, so it won’t be rain that is too cold. Plus, after those three days there is a good stretch of warm sunny days ahead. That’s right when my resupply of raspberry lemonade mix comes! Is it a good or bad omen to have a magpie sitting there right at the start today?? Hopefully, the first two days should just be showers on and off, but the winds are concerning. The trees are already swaying a ton tonight. On the third day, there may be thunderstorms the first half of the day, and I am not excited about that. That’s still a bit away, so ok hoping it shifts. It may be a shelter hopping leg. Love these shelters! I was fully occupied in my mind for the half day hike out today. I enjoy the peace and quiet when I leave town and it’s nice to clear my head. 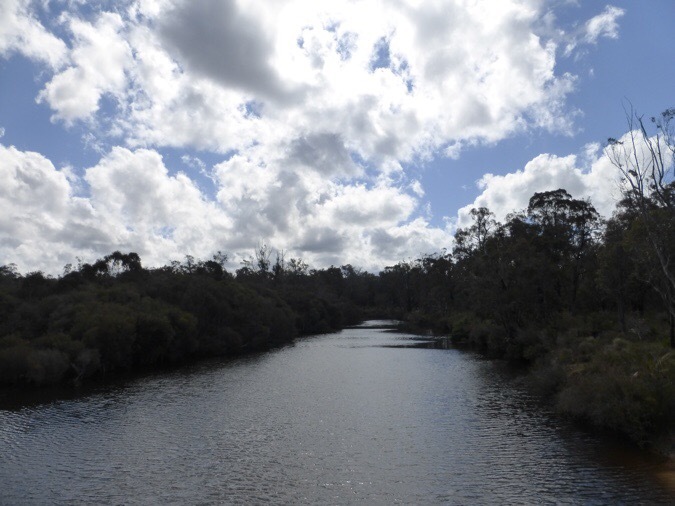 The trail went along the Collie River for a bit and also passed the Mungalup Dam (“up” is at the end of many places and means near water). Since this is a more used area, there were more public roads with cars that I crossed and much more litter and broken glass. Not surprising with how accessible this area is, and it is still much better than anything that is usually along populated areas in the US. My favorite tree out here again! 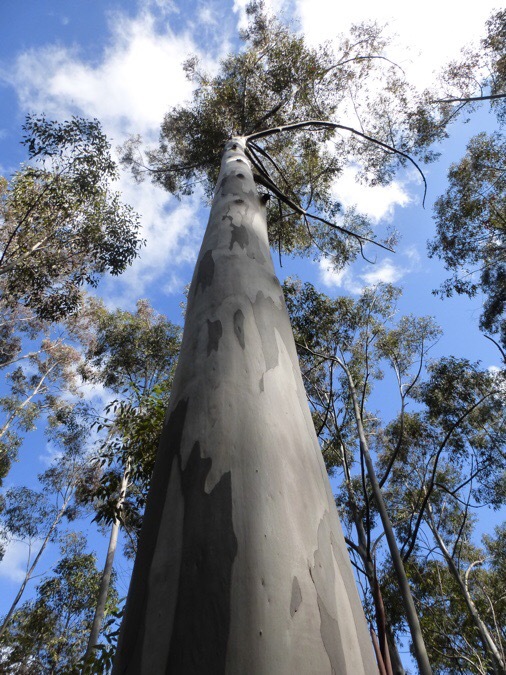 Sydney Blue Gum (I think). As I hike, I have been using my friend, Buck-30’s journal from 2010 when he hiked the Bib going northbound. He recently told me about an app that I love called Pocket. If you don’t have this app you totally should. It is great for hiking! It basically saves almost any online article I like to my phone offline for later reading. I can click a button on my phone or on my computer, and it is automatically put in the app. It really is that simple. There is even a feature that reads the entry to you. So, each day I have the fun of listening to Buck-30s journal of what I’m doing in reverse. His entries crack me up and I do enjoy all of his vivid descriptions with spot on humor and emotion. Here’s a funny one of his from the Bib. I tend to listen ahead a couple days and it helps me know what’s coming. While I am in town, I am able to see articles I want to read, and throw them in the pocket to listen to later while I’m walking. Since I am not a big reader, this is a huge app for me in daily life as well. I can have journals or articles read aloud to me while making dinner or doing other things around the house. Do be careful if things are important to double check because sometimes they don’t convert. I tried a page that had flora and fauna of this trail, and for some reason it didn’t pull everything over. Overall, it is awesome! I have all the journals I want as a resource for the Te Araroa already loaded. I don’t think I’ve seen this one yet. Now that I have given my tip for the day, let’s get back to the Bib. My point in bringing this up is that Buck-30 used the word pleasant to describe the Bib. He hit the nail on the head. 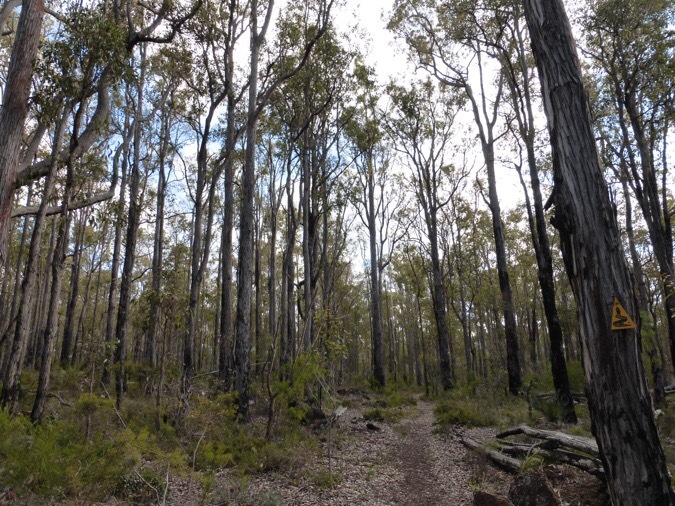 The majority of it is really just walking on old road beds through forest with few viewpoints. It doesn’t sound very exciting and, almost sounds boring, but I’ve really enjoyed each day. As Buck-30 said, it’s just so damn pleasant that you can’t help but like it! It is just downright pleasant. I’m even saying this when I’ve had a good deal of cold rain and know more is coming. I find it interesting that I’ve come across so many people that are hiking shelter to shelter and stopping around noon or one for the day. I wonder how they aren’t getting bored, but again, somehow it is just so pleasant out here that you just enjoy it. It’s not uncomfortable and there seems to always be something to look at or listen to in these woods. Yesterday, I left the shelter at 12:30pm and Lance was there and going to stay the night. I asked him if he had a book or something that he did the second half of the day. He said nothing and that he didn’t even have the guidebooks that he could read. He just used the maps. Like many others, he mentioned that he enjoyed looking back on the logbook and the journal book that is in each shelter. I can understand that. There is some really cool stuff in there and it is like reading everyone’s personal journal as you go. I only put entries in sporadically in the logbook, but many people write full journal entries each night in the red book. You can see that I can learn a lot about someone with the questions that are in the logbook most fill out at each hut. I can see many ahead of me I may meet in the coming week. I could see it being entertaining to find favorites as you hike and to read their full experience as you’re going forward. Some even leave art in there that is cool. It would be just like reading my journal but you get to read my entry each night when you got to the next shelter. I could see the fun in that. If there was a way to put those in the pocket app I would love it! Speaking of Lance, who is not Leonard, I am horrible with names. I did get an email from him today when he got to town. He let me know that last night he made a flyswatter out of a Zamia Palm plant and named it in my honor and left it to stay at the Harris Dam shelter. What a unique person! Lance is one of those men who could be dropped off in the middle of nowhere and somehow find a way to make it out alive with no supplies. 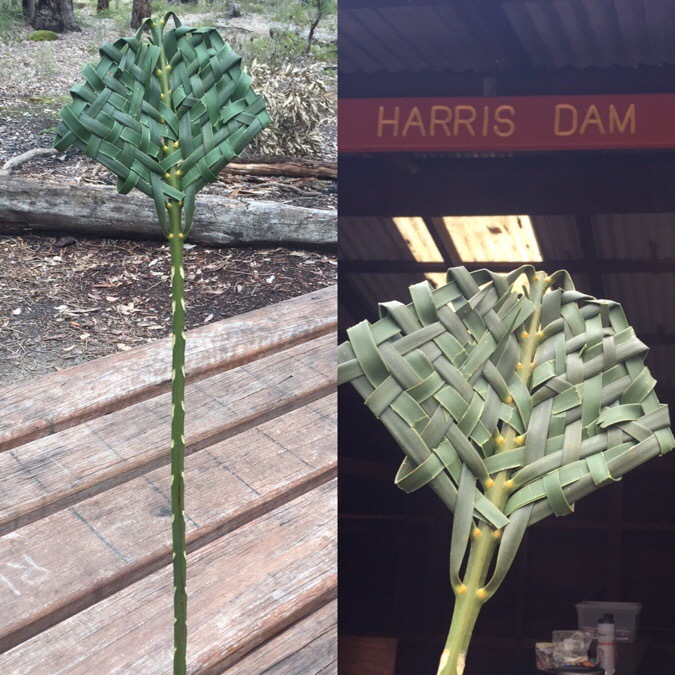 Zamia Palm flyswatter made by Lance. 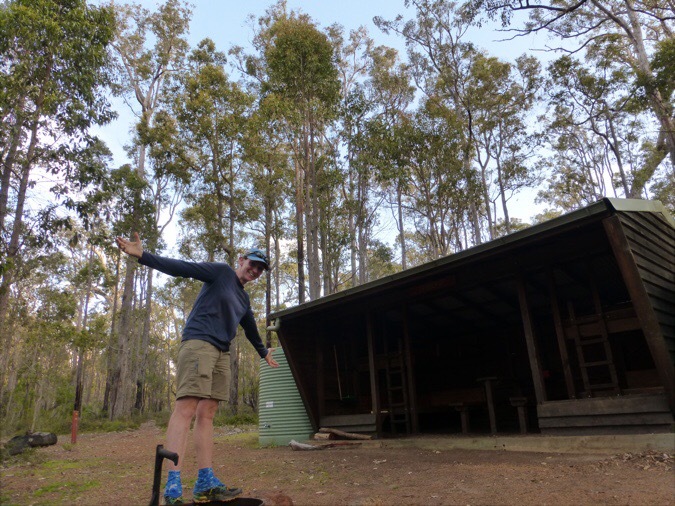 I made it to the Yabberup Shelter at 5:30pm tonight and had it all to myself. 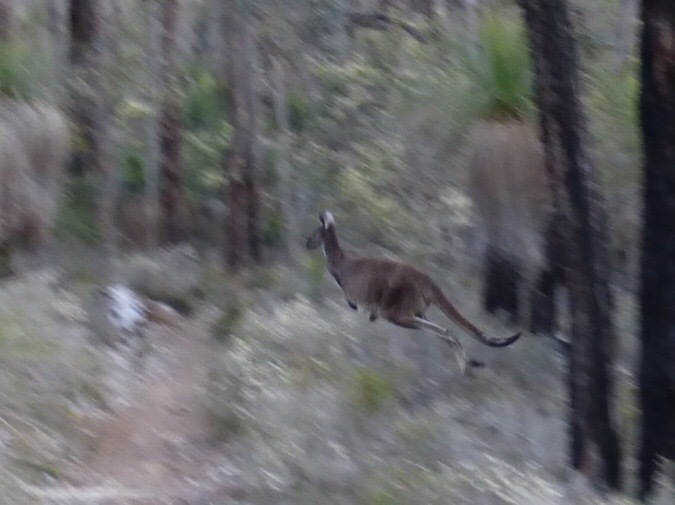 Just before I reached the shelter, I saw two roos and finally got a photo of one in action! Finally got one bounding across the trail! It seems that the rain should start tomorrow around guess what time? Yep! Somewhere around 4 or 5am there is a low percentage of rain showers and it builds as the afternoon goes on. I am happy to be in the shelter tonight as the winds gust out there. We will see if I end up shelter hopping the rest of this leg. I am off to watch an episode of Bloodline! Oh, I heard that this leg is where phone reception gets less frequent. Don’t worry if the posts are delayed. I get them up when I get service. Is the Australian Woolworth’s the same chain that used to be so common in the US? No, I don’t think it is. I was wondering that too. Glad things are going well for you even with the rain showers. Hope the wind doesn’t get too strong. Stay safe and continue to have a fabulous time and letting us in on it!! The weather in Perth is improving, looks like Spring has finally arrived. I’m in the UK, I FaceTimed my Perth-based daughter yesterday, she and my grandsons were at the local park in t-shirts. Since you’re walking south, hopefully the warmer weather will catch up with you soon. I’m enjoying your blog posts, I think of them as “Wake Up to Wired”. With you being 7 hours ahead of the UK, you’ve usually posted the previous day’s blog by the time I get up here! The magpie is most likely not ominous but it may be mischievous. 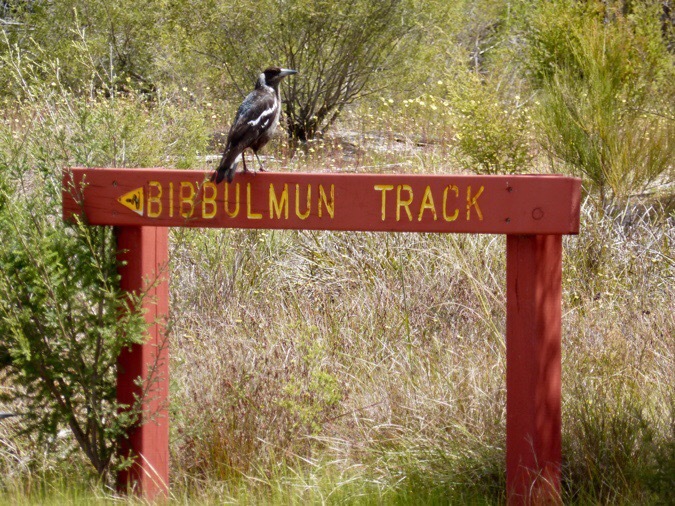 It’s beak is pointing the wrong trail direction, ha! And you shot of the kangaroo is a keeper after they were too camera shy. Mountain House arrived yesterday. My Cat loved the big box more. Earthquake danger deemed down.. but two more quakes over 3.0 in same area, so who knows? New Zealand is similar to our area but they have had more recent large quakes. If you get to Christchurch, you will still see damage, I believe. am loving your posts. So glad to see that you are more relaxed, and slowing down to let the wilderness seep into your soul. You might wish to try staminade powder as a change from powerade, also available from Woolworths. BTW lemonade here is usually taken to mean a fizzy, carbonated drink. I’ll keep an eye out for that. 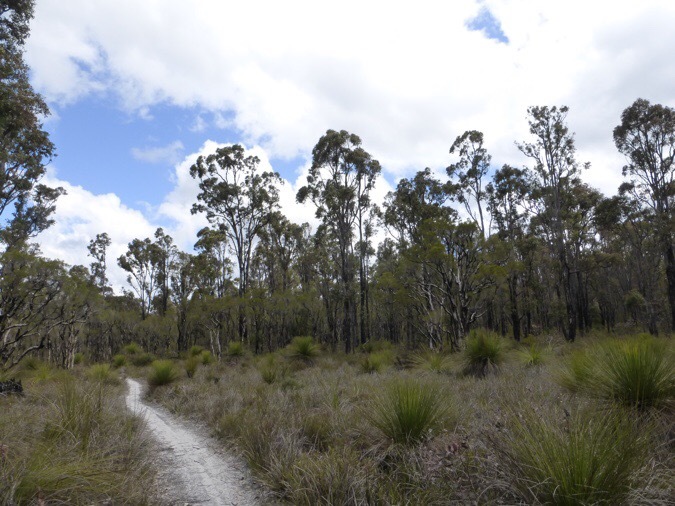 I really like the looks of the bush walking. And I’d enjoy reading the journals like Lance does. Great way to end a day.